Siem Reap Booyoung Country Club features shimmering creeks that wander into play almost lulling you to complacency by their continual beauty until suddenly you find yourself wet. Water is the most prevalent distraction on nearly every hole at this course followed by large and strategically located greenside bunker placements, with fairway sand traps completing the list of things to avoid during your round. Apart from the fairway traps, the landing areas are wide and rather forgiving. A few minutes out of Siem Reap on the road to Phnom Penh, it is located on the doorstep of cultural touring paradise, Angkor Wat. 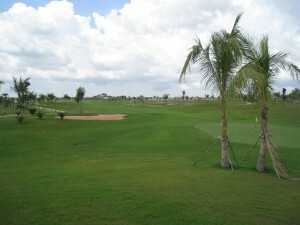 The layout impresses you initially as quite forgiving because of the wide fairways on the opening holes. When the water starts catching your eye during play, and when you encounter bunkers that tighten some of your tee shots and you have to avoid lateral water hazards on many of the holes, you begin to rethink your first impression. Creeks surprise you out of nowhere with more water that often is not visible from where you play your shots. Approaching the greens can require some decision making, especially if you are out of position relative to the pin placements because sand traps tighten the entrances to many of the greens. Aesthetically, the palm-lined fairways make this Siem Reap course very appealing. Its playability is enhanced by presenting pros, seniors, women, and kids with no fewer than five tee positions on each hole that effectively transform the layout into five different courses to satisfy every golfer’s ability level. The terrain in general is flat with minimal changes in elevation throughout. The fairways have ample landing areas and the larger than average greens are typically in fine condition. 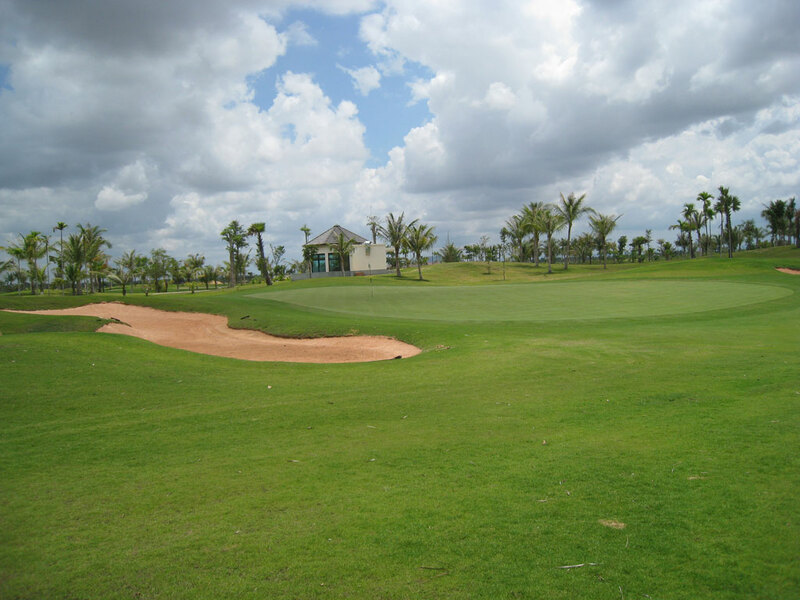 Beautifully laid out in lush green countryside and surrounded by tranquil palm trees framed by tropical blue sky, this track evokes a sense of calm and well-being that is conducive to a pleasant Cambodia golf holiday. The peaceful country views reflect Khmer Empire history as captured by designer Kentaro Sato in his admirable design that pays homage to the indigenous culture of the region. The fairways and greens are typically in fine condition year round and everyone at the resort—from the food and beverage team and hotel staff to the caddies and pro shop personnel—is quite friendly, professional, and knowledgeable. They are consistently smiling and eager to assist guests with every request. Every amenity you could want is available in the spacious and architecturally intriguing clubhouse that echoes the cultural motif of the Khmer Empire. Authentic Korean cuisine is the highlight of the clubhouse dining opportunities, and function rooms welcome social and business groups to enjoy the capable and experienced service of the banquet staff. As with all of the golf courses at this destination, the principal tourist attraction for travellers when not playing golf is the World Heritage site at Angkor Wat. This spectacular historical footprint of civilizations past is arguably the most famous and most visited cultural touring opportunity in the region, making this a must see golf holiday for the entire family. While the Siem Reap Booyoung Country Club continues to remain under one ownership, the property has undergone multiple name changes; the first being Angkor Lakes Golf Resort, then Siem Reap Lakes Golf Resort, and Siem Reap Resort Golf Club and Siem Reap Booyoung Country Club. Get in touch with one of our booking professionals now to learn more and to add this course to a Cambodia golf package for you or your group.